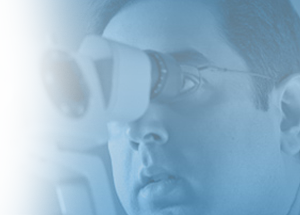 Download a free Retinal Diseases Guide from the ophthalmology program ranked best in Ohio. Seeking treatment as soon as possible is beneficial when it comes to many retinal diseases. As a Cole Eye Institute patient, you’ll be seen by specialists recognized for their expertise in diagnosing and treating the full range of retina disorders, including age-related macular degeneration (AMD), diabetic retinopathy, retinal detachments, macular hole, macular pucker, retinal inflammatory disease and more. To schedule a consultation with one of our retina specialists, please call us toll-free at: 844.895.9323. An annual comprehensive dilated eye exam can help aid in early diagnosis and treatment of many common retinal diseases. "Prior to coming to the Cole Eye Institute, I could not see out of my left eye because of a retinal condition. After beginning treatment my vision began to improve. I look forward to my visits at Cole Eye, the staff is just wonderful. I was impressed by their expertise and appreciated their thorough explanations. They even know me by name!"